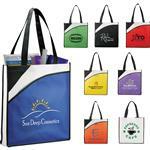 The Venture Business Tote Bag by Adco Marketing. 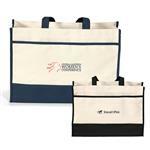 Great for trade shows. 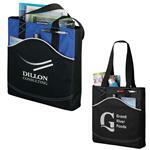 Tote your brand with style! Zippered main compartment provides ample storage. Front pocket with Velcro closure. Pen loop (pen not included). Mesh pockets for water bottles (water bottle not included) and other easy to reach items. 28.5" shoulder straps and grommet details. Back panel of each bag matches primary bag color. 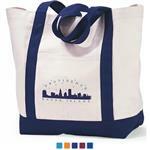 This is one of our staff favorites in tote bags! Price includes 1-Color, 1-Position imprint. Full Color imprint available! RUSH PRODUCTION AVAILABLE! Available Colors: Black, Royal Blue, Santa Fe Red, Apple Green, Turquoise and Purple. Production Times Available: 5 Working Days. Free Rush Production available, please inquire. Front pocket center 5.5 dia. Screen, Full Color Imprint, Embroidery. For embroidery, pricing depends on stitch count. For Full Color Imprint: - No setup. Running charge of $2.55 up to 299 pieces, $2.20 up to 999 pieces, $1.99 for 1K or more.